Happy Fit Fridays! I have been so bad about posting these lately. Maybe because I haven't been feeling like I was doing such a great job of staying "fit" recently. I continued my workouts but not as frequently as I had been, and I was feeling blah. Well, this week I definitely took control and changed that. I've been at the gym every day (including Sunday), and I'm feeling so much better about myself already. 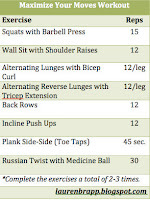 So, as I write this, I've decided to try something with fit Fridays...add a "Weekly Workouts" blurb, where I share the basics of my workouts for the week. I won't post all details (though I'm happy to if you're interested! ), but I will share when I went, what I did (cardio, strength training) and how long I did it. I'm aiming for some extra accountability! Rest Day – in Chicago! The workout I'm sharing below is one I noted above. I love it because so many of the moves are dual - targeting arms and abs, or legs and arms, etc. By focusing on two areas I don't have as much time to dwell on how one area is burning or whatnot. Plus, you get a whole body workout with fewer moves. Score! *Complete the exercises a total of 2-3 times. Once you have a good idea of the various features youe looking for in your ideal fitness machine and have a fixed budget in mind, buying an abdominal exercise machines shouldn't be too hard. Oh wow, I bet those wall sits with the shoulder raises are killer! 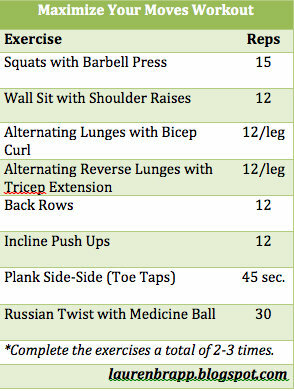 Looks like an awesome workout :).